Tebet Sub-district Forestry Unit and PPSU personnel evacuate fallen trees on Jl. KH. Abdullah Syafei, Manggarai Selatan, South Jakarta, Monday (10/29).
" 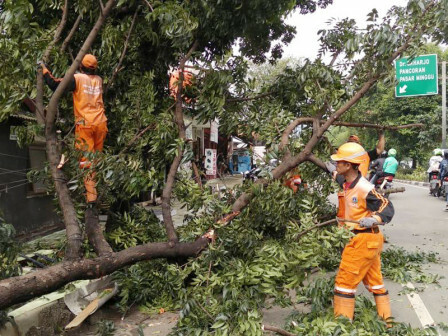 We need to evacuate it immediately thus it won't hinder the traffic flow"
"We deploy 13 Forestry Unit and PPSU personnel to clean mahogany tree which is fallen on the road," stated Agung Maulana Saleh, Manggarai Selatan Urban Village Head. He stated, personnel cut this tree in several parts using chainsaw and evacuate it using truck. "We need to evacuate it immediately thus it won't hinder the traffic flow," he conveyed.